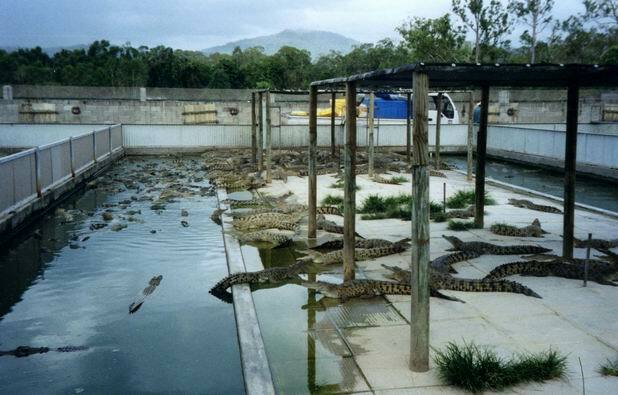 Crocodile farm at Innsfail, close to Josephine falls, QLD. The largest crocodile farm in Australia at Edmonton. In such a yards young crocodiles are supposed to grow up. Usually, it takes 3-5 years to grow up into a appropriate size. Of course, time by time crocodiles are being checked & large ones would be caught & brought into another yard for larger crocodiles. I wouldn't be happy to be one of employees here... Truck in the background feeding reptiles with fresh meat.